"The hotel was clean. I had a good stay.2019-01-03"
"OK for a pet-friendly hotel. Our room was small. The security door was broken, and there was quite a bit of garbage around the door. We've stayed in nicer Sleep Inn hotels; this one was really just average.2015-11-03"
"Reasonably priced hotel. The room was clean and we slept well. The shower floor was a bit slippery. Good continental breakfast with hot and cold items. We'll stay again.2015-09-07"
"The hotel room didn't smell clean. The bedding was stained, and there was a used washcloth on the floor in the bathroom. Bad check-in experience. 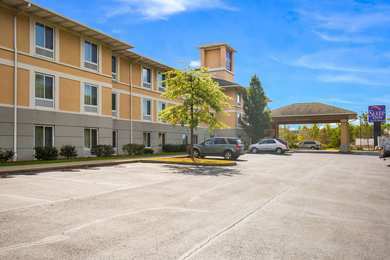 You might want to find another place to stay.2015-07-02"
Learn more about Dunmore Hotels & Motels in our Dunmore Hotels Guide.